This isn’t the romanticized WWII of modern cinema, it’s probably closer to the real thing. The Story of G.I. Joe is based on print journalist Ernie Pyle’s interviews with soldiers in the field. Pyle was in the foxholes with them, and he was in it for the long haul. His newspaper column became the public’s window into life on the battlefield. William Wellman’s (The Ox-Bow Incident, The Public Enemy) film adaptation indicates that, for the soldiers, the war wasn’t about winning. It was about surviving, day by day. 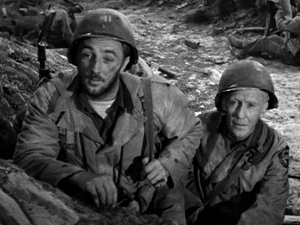 I love William Wellman for keeping his war movies so grounded. Burgess Meredith plays Pyle, but it’s really an ensemble piece, including Robert Mitchum in a nicely understated performance. Most of the extras and some of the cast were actual soldiers, many of whom died in battle shortly after filming. Pyle also never saw the film completed. He was interviewing soldiers in Japan when he was killed by sniper machine gun fire, three months before the movie was released. In light of these facts, the movie’s otherwise optimistic ending becomes unintentionally bittersweet.